I know I keep writing about dry skin, but this Winter it has REALLY been a struggle for me. 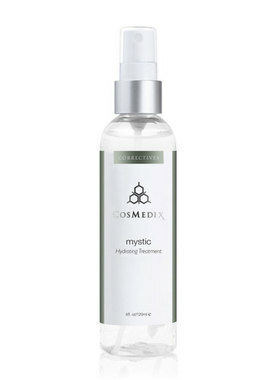 Many things have helped, but I recently started using the CosMedix Mystic and FINALLY found my magic product! I grabbed some off the shelf last week while I was in the office and have only been using it for about a week. I have been using Mystic every morning and evening after washing my face along with using it to "set" my makeup after application. My skin is FINALLY getting back to its normal state. No more flaking and I am actually beginning to see a bit of a glow return. One of the reasons I love this product so much is its ease of use. I have no idea why, but when I have to apply a lotion or cream it always seems like more work, so sometimes at night it just doesn't happen during my nightly ritual. With CosMedix Mystic, all I have to do is spray so I have been consistent with using it and the results speak for themselves. Don't forget! You can save 15% on every order by using code: PRESIDENTS at checkout. Until next time......stay tuned and stay beautiful! I love Cosmedix! My skin is always dry, and definitely flaky during the winter, so I think I just might have to try this..
CosMedix is one of my ALL TIME FAVORITE brands! LOVE THEM! I can't say enough how much I recommend this product. I have continued to use it and the results are fantastic!